Below we provide examples of tools countries and others looking to increase access to medicines can use to overcome patent barriers when needed. We suggest you read this introduction carefully to assess which tool is relevant for your country’s situation. This section presumes familiarity with international intellectual property law and its impact on medicines prices. For introductory resources on patents and access to medicines, please visit our resources section, or go to www.accesstomedicines.org. There are several legal measures available to enable access to affordable medicines and to protect public health. An example is compulsory licensing. A compulsory licence is an authorization granted by a government authority that allows the person who receives it to use the invention without an agreement of the patent holder. That means that he or she can import, manufacture use or sell copies of the patented product, without running the risk of being sued by the patent holder. The patent holder is entitled to compensation (i.e. royalties), which has to be “adequate” according to TRIPS Article 31(h) – except when the license is granted to remedy an anti-competitive practice. The amount of the compensation is generally fixed by the authority who grants the licence. Guidance for setting royalty rates can be found here [pdf]. A ‘government use’ is a special kind of compulsory licence in that the State is granting the authorization for its own use (“government use”, “Crown use” in Commonwealth countries, “licence d’office” in French-speaking countries) meaning that the authorization is given to a state agency or department, or even to a private entity. In the TRIPS Agreement, government use is referred to as “public non-commercial use” (see Article 31.b). Government use can be particularly useful in procurement of medicines by public institutions because it allows governments to run public tenders and purchase from the best priced provider. Least developed country (LDC) members of the WTO can resort to postponing the granting and/or enforcement of medicines patents altogether until at least 2033. This waiver for LDCs was created by paragraph 7 of the Doha Declaration on TRIPS and Public Health and extended through subsequent decisions of the WTO TRIPS Council. No payment of compensation is required. For more detail on this waiver, see the WTO’s website. Before deciding whom to purchase from, it is important to identify suppliers that offer quality assured products. For more information on quality assurance, see here. 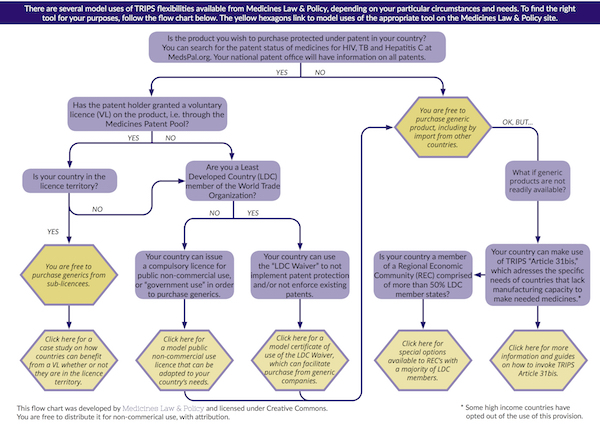 Model licences for public non-commercial use of a patent. This is a type of compulsory licence also known as “Government use licence”. Declarations by Least Developed Countries to invoke the right to not grant or enforce pharmaceutical product patents or data protection. This is often called the “LDC waiver”. Special uses of compulsory licences for export to countries that lack the manufacturing capacity to make the needed medicines. Now referred to as Article 31bis this was previously known as the August 30th decision or Paragraph 6 mechanism. See the questionnaire at right for a guide to determining what tool is best for your needs. Questionnaire: Which Tool is Best for You? We suggest you go through the following list of questions to decide which of the tools available on this site is best suited to your needs. Links to all available tools are at the bottom of this page. Alternatively, you can download this flow chart to determine what tool you need. Are you a Least Developed Country member of the World Trade Organization? If yes, you can make use of the LDC waiver and either not implement patent protection or not enforce a patent that already exists. A supplier of generic medicines will likely want to see a confirmation that you make use of this option. Go here for a model text of an LDC declaration. Is there a patent on the product you want to purchase? You may look for patent and licence status of HIV, hepatitis C and tuberculosis medicines in your country on MedsPaL.org. If no, you can purchase from generic suppliers. Note that there will likely be regulatory requirements in the country that need to be fulfilled. For more information on medicines regulation see WHO’s Prequalification of Medicines Programme. If yes, has the patent holder granted a voluntary licence, for example through the Medicines Patent Pool? This information is also available on MedsPaL.org. All MPP licences are here. If yes, is your country listed in the territory of the licence agreement? If yes: You can purchase from the sub-licensees (generic producers). If no: You need to issue a licence for public non-commercial use. Here you will find a model licence you can adapt and fill in. Note that sub-licensees – for example, those of the Medicines Patent Pool – will be able to supply to a country outside the territory if a compulsory licence has been issued. For an example of this, see this Lancet article on Hepatitis medicine sofosbuvir. If there is no voluntary licence, you have to issue a licence for public non-commercial use to be able to access generic supply. In the case of public non-commercial use, TRIPS Article 31 (b) does not require the government to enter into negotiations to try to first obtain a voluntary licence. Here you will find a model licence you can adapt and fill in. What if there is no generic supply available? If there is no generic supply available, you will need to make use of the system of TRIPS Article 31(f) to trigger production of the needed medicine by a generic company in another country. The WTO has created a special compulsory licence pathway for situations where a country does not have its own production capacity or not sufficient production capacity to produce the medicine and the medicine is patent protected in a country that does have production capacity. This pathway is known as the “Doha Declaration paragraph 6 mechanism” or the “30 August 2013 solution” and has recently been amended to the TRIPS Agreement as Article 31 bis. For more information see here. Click here for a flow chart you can use to find the right tool.